Star Plus’ show Ishqbaaaz which is been airing on the channel for more than 2 years. The show has not only gathered a huge amount of fans online and on the charts but also the show has so many awards and recognition in its kitty as well. Recently the producer of the show Gul Khan took a decision that left the die hard fans of the show devastated and shattered. Well as per the producer the show is not doing really well on charts from some months so she decided to revamp the whole story followed by the exit of all renowned cast of the show except Nakul Mehta. This announcement made the end of watching “Shivika” onscreen and exit of Surbhi Chandana from the show confirmed. Some days ago also the leading lady of the show confirmed her exit from the show by posting a video message for fans and promise them to be back soon with a bang. Well the fans of the show are in no mood to let the matter go in drain. The die hard fans of Shivika want justice for their favourite actress as they feel she is being cheated and ill-treated. Surbhi who entered the show when it was facing some issue in the ratings and then her chemistry with Nakul was blockbuster and rest is history. With the trend that is rounding in twitter in demand of ending Ishqbaaaz and end the story with shivika have a new add on. Yesterday the whole Mumbai people wake up with a pamphlet served with Times of India newspaper. 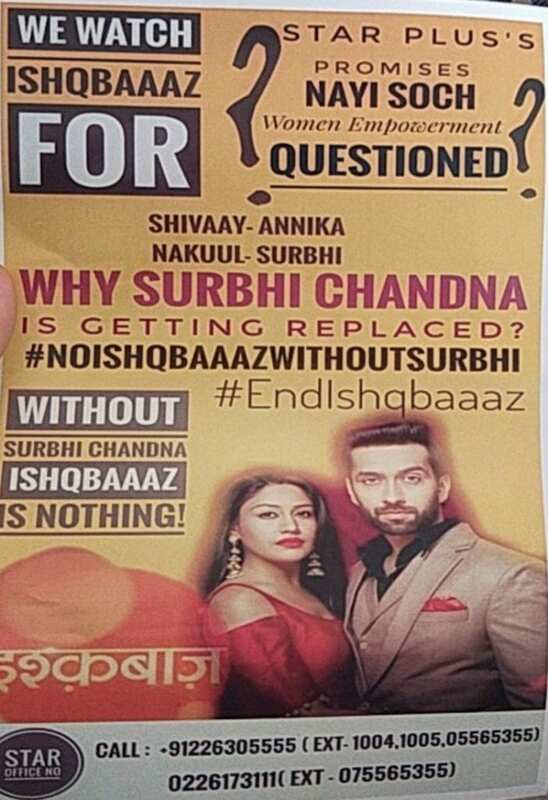 The pamphlet is about making people know about the fact the viewers watch it for Shivika and there is no reason for makers to cut off Surbhi from the post leap story. Now that is something new to pay attention for and it will be interesting to see that will all these acts by fan will ultimately let the channel change their decision??? Well time will tell the answer. Happy New Year! Here’s Kaal Bhairav Rahasya 2 actors’ NY resolutions!